Every parent dreads the sugar rush and crazy times after their kid has inhaled their bodyweight in sugar and candy at a party. 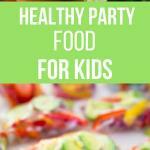 Why not become the parent all the other parents love by serving up some healthy party food at your next party. 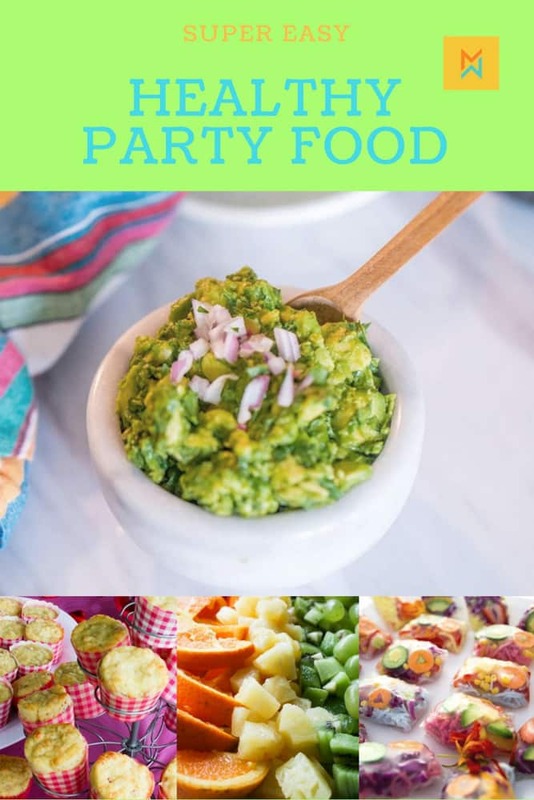 We promise these super easy and healthy party food ideas will still be a big hit with the kids ( and grown-ups ), taste amazing and all without the huge sugar high. With a little imagination, we show you how you can use these sugar-free party food ideas for any party theme. 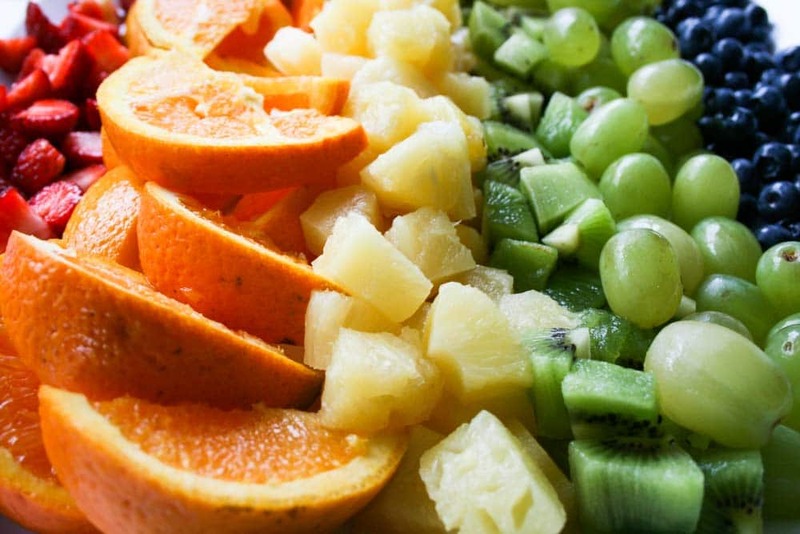 Keep reading to find the perfect healthy kids party food for your next celebration. Popcorn is one of the best finger foods for a party. It is such an easy and delicious party treat for children of any age. Pop your own to save a tonne of cash and make it super healthy. You can add a little salt and butter to flavor or for a cheesy taste how about some nutritional yeast. The secret to make this fit any party theme is some clever food tags. 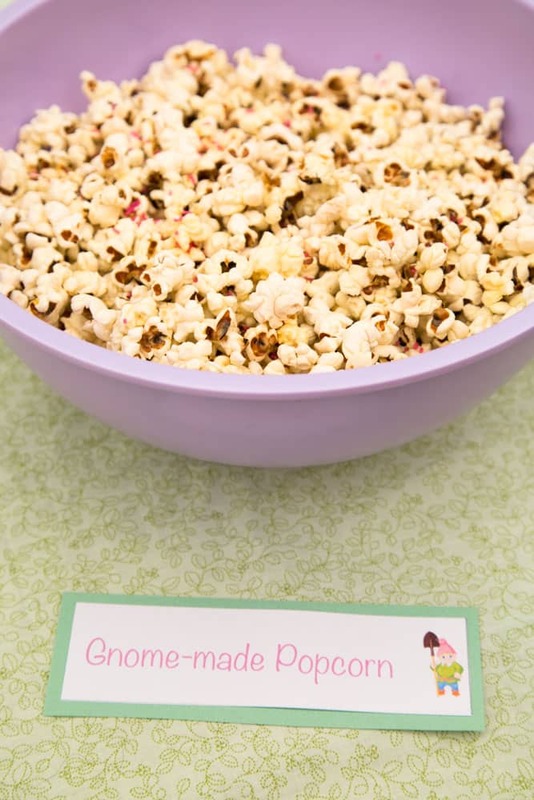 We used this ‘gnome-made popcorn’ for a fairy party, but have used ‘explosions’ for a science party, ‘snow flurries’ for a Frozen party and ‘pup corn’ for a cute puppy party. 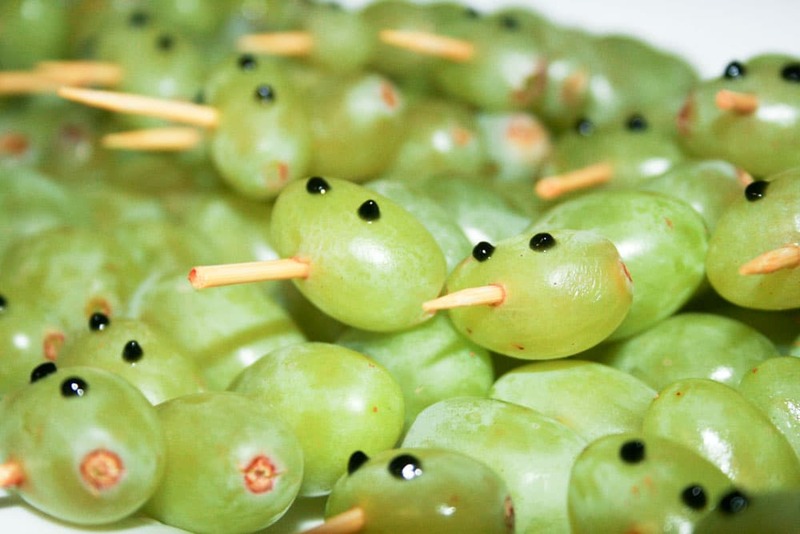 This is one of our favorite kids party food ideas. 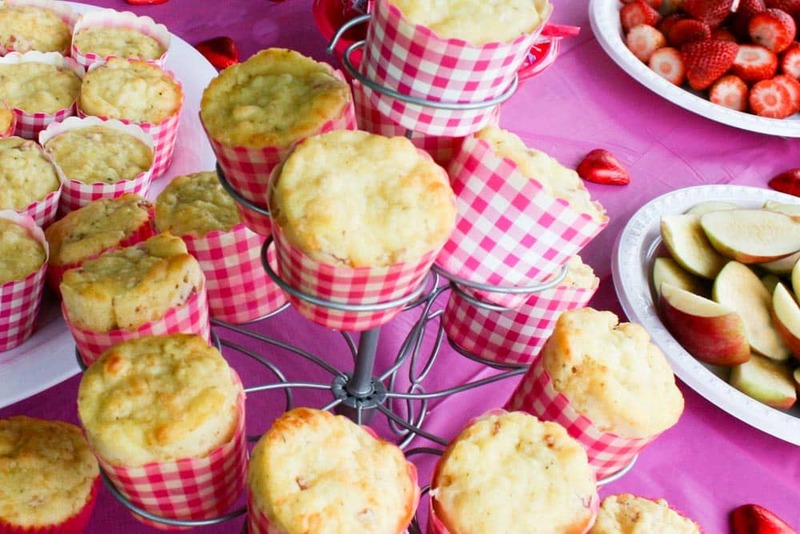 Savory muffins are always a huge hit and can replace sugar-laden cupcakes easily. Some of our favorite flavors are Ham and Cheese and Pizza. Be sure that your muffin cases match your theme and again you could have a little fun with the food labels or little party flags are such a cute idea to keep your theme going. 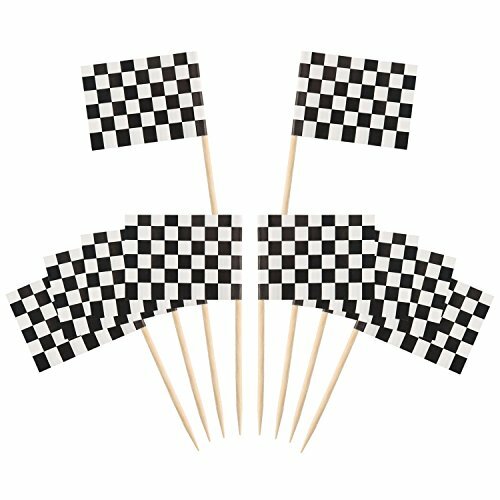 We love these for a racing party theme. 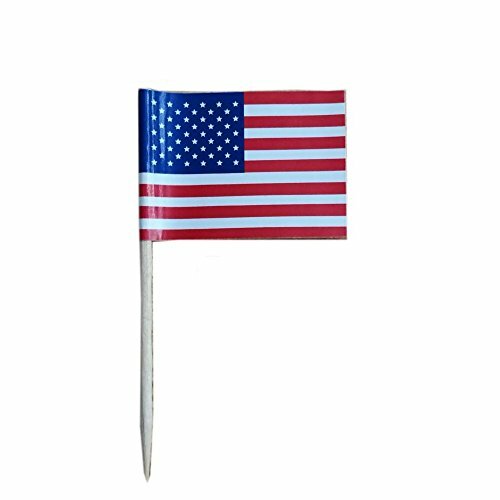 And these are perfect for a 4th of July Party. 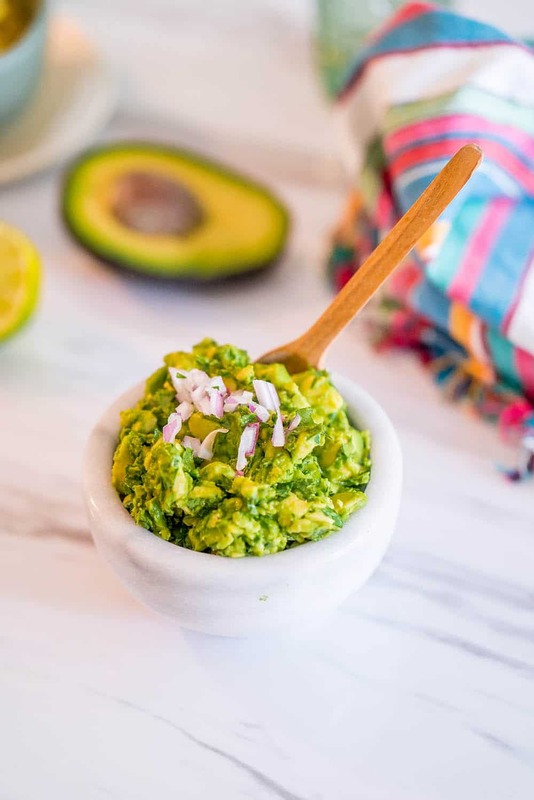 Guacamole is always a good idea for a party and this amazing, easy guacamole recipe will be a huge hit with all ages. Serve with fresh cut up veggies, corn chips or with boiled eggs. There are so many fun options. Perfect for every party from a Mexican Fiesta, a Cinco de Mayo party to a fun Turtle party food treat. These vegetarian rice rolls not only taste amazing, are super healthy but also look fantastic too. 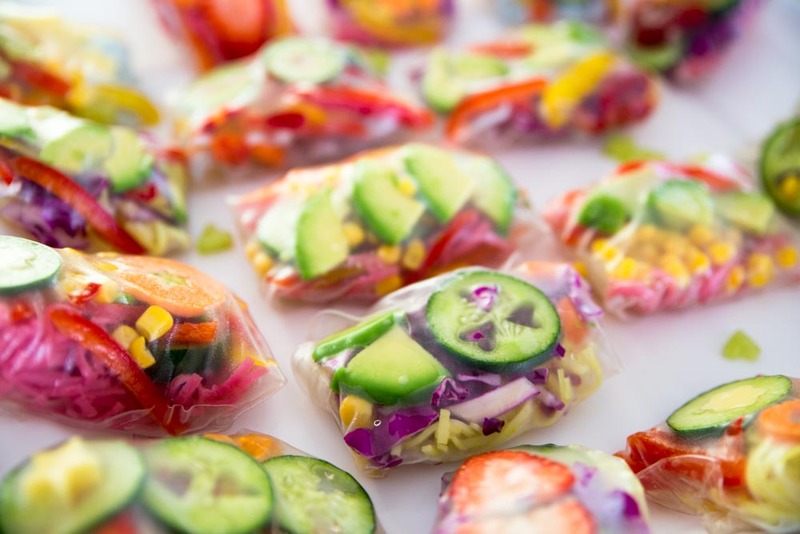 Perfect to serve as rainbow party food, or any brightly colored party theme. These are excellent healthy birthday party food ideas, how not to love all the colors? Want more Rainbow Party Ideas? Click to discover easy and gorgeous ideas. What is it about food on a stick that makes it better? Haha. You can be so creative by popping different fruit on a bamboo skewer. It is also an easy way to keep the mess down and ideal for little fingers to enjoy the perfect healthy party treat. 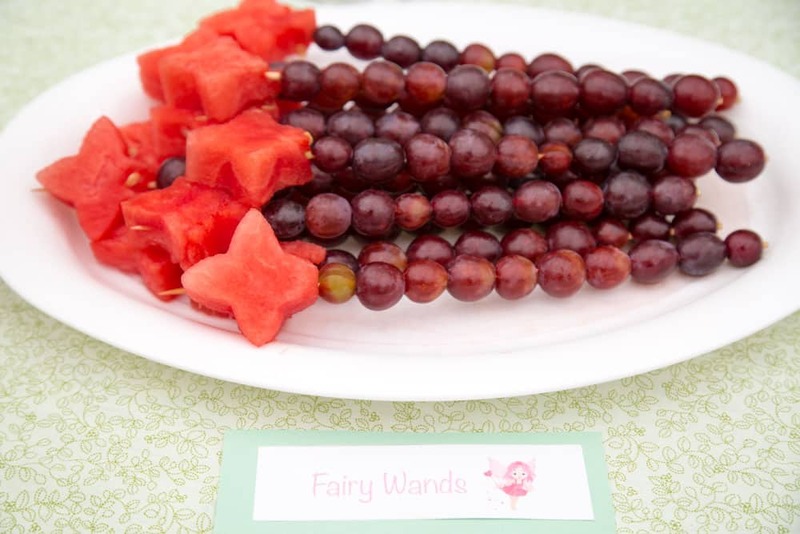 Some of our ideas are too cute fairy wands and these grape centipedes which are perfect for a Bug theme party. Be creative with the colored fruit you use and use cookie cutters to make shapes from fruits like watermelon and kiwi fruit. Finger foods for kids don’t need to be unhealthy. Eating a rainbow is the best way to be healthy so this stunning rainbow fruit platter is such a great healthy party food idea. Pick in-season fruits from all the colors and watch how quickly they go as a sugar-free party treat. Make this for a fun art party theme or a St Patrick’s Day treat. Read our guide for healthy eating for children here. Add a little bit of fun to your kids birthday party menu. Let your imagination run wild and create a fun fruit animal to fit your party theme. 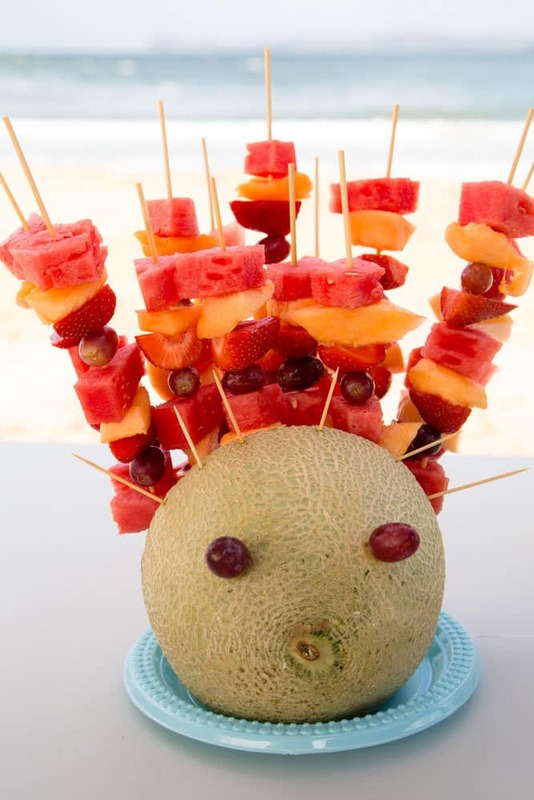 This blowfish melon is perfect for a fishing or mermaid party theme. Take a look online for some great ideas and remember, you don’t need to be an artist to make this work. 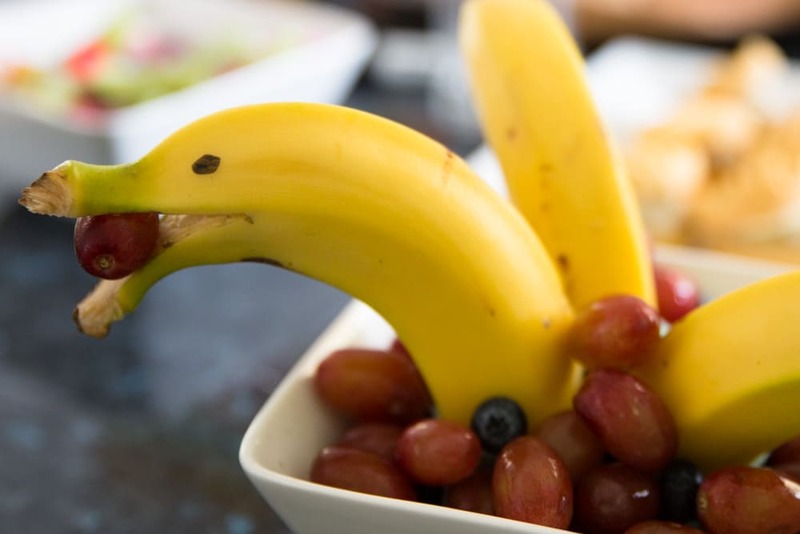 Even something simple like the banana dolphin below can be effective and it is a super easy kids party food. Did you work out yet that we adore food labels? Honestly, with a little imagination, you can create so much fun themed party food. 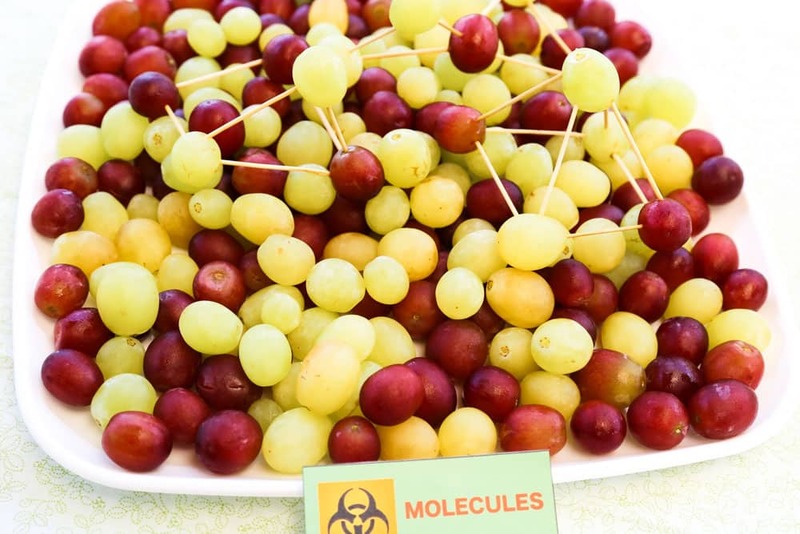 Check out these molecule grapes for a science party. All you need to add is a few tooth picks. You could have unicorn nibbles with brightly colored fruit, Fruit Lightsabers for a Starwars theme party and Truffula Fruit for a Dr Seuss party. Love unicorn theme food? Try our healthy Unicorn toast. 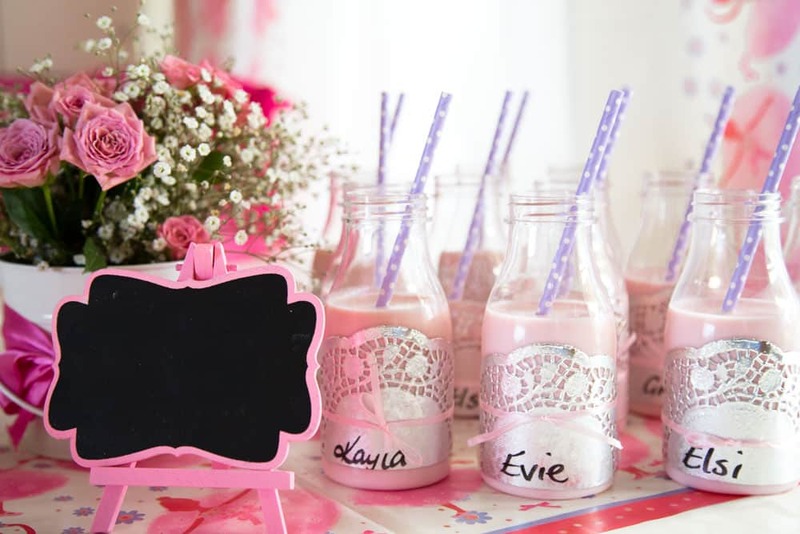 From children’s party food ideas to drinks. Skip the cordial and juice which tend to be full of sugar and opt for healthy party drinks. Color milk with fruit, like these natural strawberry milk drinks. One of our favorite ideas is to serve water with a fun tag. H2O for a science party or Mermaid water for an undersea party theme. If you think water is just too plain why not serve with some creative ice cubes? You can freeze fruit in ice trays, try pretty edible flowers or get some fun shaped ice trays. We hope you loved our healthy party food ideas. If you are looking for some more party inspiration head here.